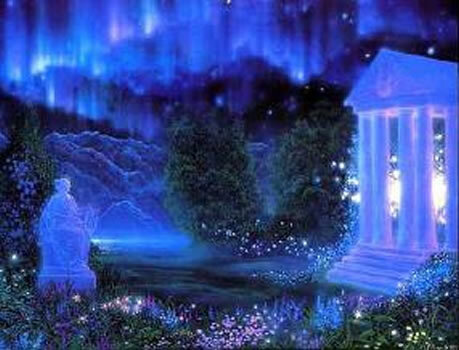 The Resurrection Temple is located in the etheric realm over the Holy Land. It is an exquisite circular temple of blazing white substance that is self-luminous and radiates the tones and melodies to be found within the "Ave Maria." The central Flame Room holds within it the concentrated Focus of the Resurrection Flame guarded and sustained by Archangel Gabriel, whose Cosmic Service is to bring to life again the remembrance of the God-image in which every man was originally created and which it is each soul's destiny to outpicture and manifest thru the flesh form. Together with beloved Gabriel, the Ascended Masters Jesus and Mary have taken the responsibility of drawing forth the Sacred Fire from the Heart of God to sustain and expand that Activity of the Resurrection thruout the planet Earth, infusing it into those who aspire to redemption and wish to return to their Firstborn Purity and Perfection of Design. The beloved Maha Chohan from this Temple directs the Resurrection Flame thru the Forces of Nature to produce the beauty and opulence of the seasons of promise and of harvest. The sincere student should ask to be taken to the Resurrection Temple each night while the physical body sleeps and there look upon and observe one's own Holy Christ Self in action. If the students could have this proximity to their own God-Image for 30 consecutive nights, much of Its Nature would be impressed upon their etheric consciousness and drawn back into their waking consciousness and into their flesh forms as well. It is the kind office of Gabriel Archangel of Resurrection to flash the Flame and Ray of His own Cosmic Heart thru the consciousness and feelings of all who sincerely desire to know the Glory they had with God before the world was. He performed this service for beloved Mother Mary when He brought to Her the word that Jesus was to be born thru Her physical form. If the students will ask beloved Gabriel to help them to realize and accept their own Holy Christ Self and to become that Christ Self in action, they will have the added assistance of His Cosmic Pressure and Blazing Consciousness which does resurrect the Divine Memory of the God-Design in which all were made, and from which many strayed in the centuries of pursuing happiness in sense pleasures. Oh from us never part! We accept Thy Perfection in Love's most Perfect Way.